We are in week 2 of marathon training, if you’re training with us for the TCS New York City Marathon. Although we seem to focus quite a bit on the various running techniques throughout the week, there’s an area that we can’t ignore—nutrition. Nutrition plays a huge part in conditioning and thankfully many of us runners love sharing what works for us and doesn’t. Here’s a recent article about Superfood Pancake published by Sarah Geahart for Runners World. It’s a recipe by Paul Warthen, a fellow whippet who is currently a sub-3 hour marathoner. The idea stemmed from his garden in White Post, Virginia. Paul Warthen craved something savory and substantial, like an Asian scallion pancake. He wanted a quick, healthy meal to satisfy his appetite after running eight miles from his house to work as a cook at a fine-dining restaurant. Warthen was training for the 2013 Richmond Marathon at the time and had a goal of finishing under three hours. He logged about 60 miles a week and worked for 11 hours a day, five days a week, at the Ashby Inn in Paris, Virginia. By the time he retreated home, practically absent of energy, he’d often survey his garden for meal inspiration. Warthen experimented with his abundance of broccoli and kale by combining both with celery, ginger, and simple pancake batter. His Superfood Pancake was born. The dish took 15 minutes to make from start to finish. Warthen’s creation is featured on the lunch and brunch menus at Tribeca-based Tiny’s, where he’s the executive chef. 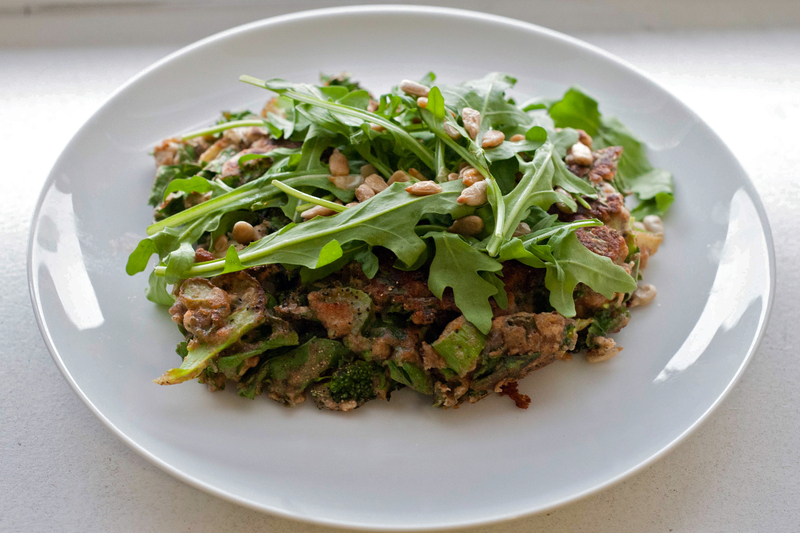 The dish is complemented with arugula and topped with sunflower seeds and poached eggs. Try it postrun or simply as an alternative to the classic sweet version. 1. Combine flour, baking soda, baking powder and sugar in large bowl. 2. In a separate bowl, mix buttermilk and eggs until smooth, then add to dry items. 3. Roughly chop kale, broccoli and celery; grate ginger. 4. In separate bowl, toss small portion of vegetables with ½ cup of batter and mix until well coated; season with salt. 5. Pour into cast-iron or nonstick pan and cook on medium heat for about three minutes or until golden brown on each side. 6. Top with arugula and sunflower seeds, optional two poached eggs. 7. Sprinkle with fresh lemon juice and extra virgin olive oil. Makes 8 pancakes. Let us know if you try this recipe and please share some of your favorites with us.